If you've been hunting down cute scallop hem shorts or skirts for the longest time like me, you're in luck. I recently found one of each and despite each piece being slightly ill-fitting, the styles and colours are perfect. The hem is very flattering on every body shape and fun and flirty for spring and summer. This morning, I opened up my Pitaya email newsletter and found a familiar pair of shorts on display - the mint green scallop hem shorts I recently bought. Pitaya is full of wonderful surprises. 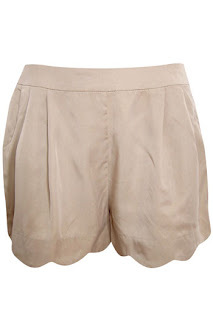 Now that I'm aware that Pitaya carries items from boutiques like Modcloth, I noticed that the Threadsence and Sosie mint green scallop hem shorts (also in khaki and black) are in stock at Pitaya. If you live in around these 17 locations, you can go instore, but the shorts are fully stocked online now too. Warning: Petites about my size will find this to fit like a M.
Petites smaller than me (like Kileen of cute&little) will find these shorts way too big. At Pitaya, these are going for $36 USD a pop. All sizes and colours are currently in stock. 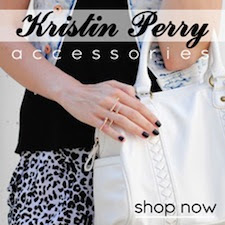 [Click] on a pair of shorts to shop at Pitaya. Next up is Sosie, selling the exact same shorts for $43 USD. Their images aren't easily saveable, so here are just the links. 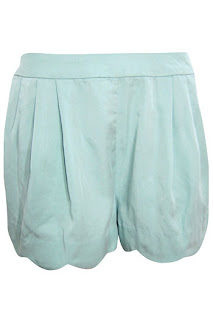 Finally, Threadsence has their "Minty Fresh Scalloped Shorts" left in medium and large. Smalls sold out almost immediately after restocking. They are selling each pair for $37 USD. [Click] on the images to purchase from Threadsence. If these don't work out, many other stores have scallop hem shorts too (Urban Outfitters is a good option for petite gals). I am not affiliated with any of these stores. Don't forget to enter my Alonai shoes giveaway! Heels, flats, boots that fit all (US size 2-14). Two winners! oh, and thanks for the mention, lol. These are so cute. I love this trend and now know how to find a great fitting pair! 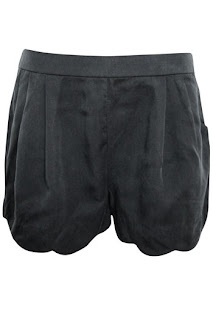 I've been looking at these cute shorts but decided on a red one from Urban Outfitters because these seems short. Really wanted the one from H&M Conscious line, they ran out so quickly! Thanks for posting this, might need to grab one. BTW I was able to post your link to your giveaway =) I was doing it wrong! Mind to check and follow my blog? I'll Hufflepuff and I'll Blow your House Down!